I think the whole retro rock thing is interesting for a variety of reasons, though it is a scene full of pretenders. It's a place where I think a lot of people want to buy into a fantasy so a lot of low level playing gets overlooked. Every once in a while though you come across a band who properly understand the importance of rock tropes and who have some serious chops that they bring to the table. Such is the case with The Riven and their self titled record now out on The Sign. This is one of those truly special modern contributions that may well merit a place in the greater canon of the genre. With a singer who absolutely belts and some truly ripping guitars this is a record that is in love with mid paced rock and roll potency. Seemingly happy to settle into the groove and then just lean in and wail it's hard not to be mesmerized by the unique approach of The Riven. This is a record that constantly pushes for bold new frontiers and hints at aural majesty of the sort that many of the bands peers can't match. If this because of superior Swedish musical education, a deep understanding of rock and roll or something else entirely, I don't know - but the clear ability to execute on a high level is very much present. Long story short - this is a record that you are going to eagerly dig in too if you're a fan of hard hitting hard rock. 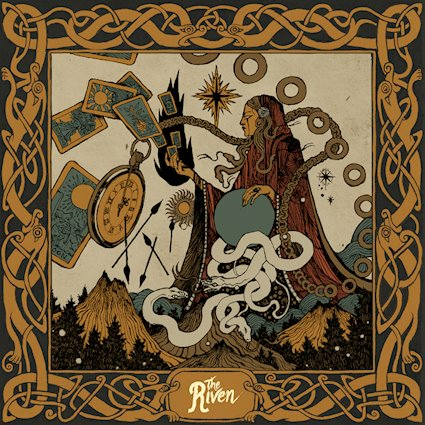 Unafraid to embrace psychedelic elements but never wandering into 'stoner doom' tropes like so many of their wayward compatriots, The Riven is a tight listen. Ebbing and flowing throughout and from end to end showing a surprising degree of class, this is a rock record for the rock fan. It may not be over the top or in your face, but it's very well executed and makes multiple listens extremely worthwhile.